Feeding an elephant in Kenya on an Abercrombie & Kent safari; photo: David Bromham. Custom Kenya safaris by Abercrombie & Kent welcome all ages; photo by Steven Dieveney. When planning a safari — one of those bucket list trips we can all agree on — you need advice on when and where to go, where to stay, what’s best for kids, health and safety, and some suggested tour operators. — The qualifications of the various tour operators, guides, and safari leaders to work with children. Unlike many other family travel adventures that we encourage, an African safari should definitely be organized by a reputable tour operator, either from abroad or within Africa. When you begin your research, you’ll find safari tour operators who promise sightings of the “Big Five” – Cape buffalo, rhinoceros, elephant, lion, leopard – and rate the game reserves by how much wildlife can be seen there. But for you, the traveling family, how you see it will be just as important as what you see. Involve the entire family in planning the trip and before you go, read about the country’s history, the places you will visit, the wildlife, and other things you expect to see. It makes it much more interesting while you’re there. Adults and children should take photos, keep a family diary, and collect scrapbook items so that when you return home you can all make an album together. You’ll keep family memories alive and create an heirloom at the same time. The best time to see animals in many parts of Africa is during the warm, dry season, when the grass is short, visibility is good, and the weather is usually dry, approximately December to April. Kenya specialists recommend February, March, September and October as the best months for maximum game-viewing. But they also stress that anytime other than April and May, the rainiest months, are fine. Most first-timers to Africa choose to visit the best known game parks — Kenya’s Masai Mara Reserve, Tanzania’s Serengeti National Park or South Africa’s Kruger National Park. Tanzania features Serengeti, including Lake Ndutu in the north, a region of fertile plains filled with wildlife. (The higher altitude near the equator also means warm days and cool nights.) The Ngorongoro Crater is another, more intimate, wildlife viewing area; it’s pleasantly cool and attracts fewer tourists. South Africa’s Kruger National Park is its best known safari destination. Families on safari for the first time will be rewarded with exciting game viewing and a range of accommodations. As Africa tourism expands (due to an improved infrastructure, wildlife management programs, and expanded international flights) travelers have also ventured into Botswana for the game-viewing experience. Experienced tour operators recommend smaller tented safari camps, which are often quite luxurious. Families often look back on their contact with camp staff, rangers and guides as well as other guests, at meals and on the daily safaris, as one of the best parts of the trip. Traditional safari lodges tend to be larger, often with up to 100 people, which affects the intimacy of the game-viewing experience. — An introduction to the lifestyles, clothing, customs, arts, dances and rituals of local peoples is fascinating for all children, and should be a part of every Africa itinerary. — A wide array of eco-adventure and wildlife viewing tours will thrill pre-teens and teens. Note that younger children may not be welcomed by tour operators, because of lodge or camp safety considerations. — Review the itinerary carefully to be sure there will be enough free time for kids to roam and run on their own. Since animal-viewing is best at dawn and dusk, will there be afternoons free for napping? — Is the tour guide scheduled for your departure dates accustomed to working with children? — Check out the operator’s track record on environmental issues. — Request references from past clients, particularly those with children, so you’ll get a more accurate picture of what you’re investing in. Each country in Africa has its own inoculation demands and safety record, and the tour operator you choose should inform you on what to expect and what precautions (health, physical safety, property safety, etc.) are recommended. During the early planning stages, research State Department Travel Advisories for the most up-to-date information on political conditions and crime statistics and the Centers for Disease Control and Prevention for up-to-date bulletins on incidences of Ebola and other health concerns. Be sure to notify your physician and pediatrician about your itinerary and discuss recommended inoculations at least six months prior to departure. Though accommodations tend to be more expensive, tour operators often recommend a tented safari over one based in lodges. However, we have heard of tented safari camps being robbed at night by local burglars, so some families may feel safer in a well-guarded and secure lodge. The tour operators listed below will provide online or print brochures, quote prices and custom-plan family itineraries on request — a great option if you have younger children in your party. Inquire about tour operators’ qualifications, and the experience of lodge managers, safari leaders and local guides in working with children. Their ability to plan suitable days (for grandparents and kids) and help children learn from this unique exposure to wildlife is vital to the success of your trip. Abercrombie & Kent Although known for their high-end deluxe tours and exotic family holidays, A&K began their business with African safaris. They offer Kenya and Tanzania Small Group Family Safaris, with separate activities for parents and teenage children, from the eight countries in which they run safaris; discounts for travelers 12 and under. African Travel Specialized in luxury custom safaris, with safari programs to South Africa’s Kruger National Park. FTF members have had excellent experience with them and report fantastic safari conditions and animal-viewing at Kruger. Call them for program information and rates; everything is customized to your needs. Big Five Tours and Expeditions Long-time luxury tour operators to Africa now include families in special summer and winter holiday safaris. Besides a safari experience, their trips include a sightseeing tour of Kenya, cultural activities, visits to ranches and other programs of interest to kids. International Expeditions offers the exclusive tented camps and country homes, itineraries in Kenya, Tanzania and South Africa, and special family itineraries. Let’s Go Travel, based in Kenya, is now part of the much larger Uniglobe and has expanded their scope of operations. They are still recommended for arranging custom safaris in the Lake Ndutu and the Serengeti, for those who are getting themselves to Tanzania and just need a local tour operator. Thomson Family Adventures For more than 20 years, Thomson specialized in bringing clients to Tanzania, and now books several family departures each year there and around the world. They are willing to plan individual family itineraries (ideal for those with younger children who aren’t accepted at many luxury tent camps.) Trips include shorter drives, more interaction with the Kenyan people and culture, and a greater variety of activities. Optional extension to Zanzibar for beach time. Ask about children’s discounts. Wildland Adventures Cited by Outside magazine for their ecotourism trips around the world and African family safaris. Focus on contact with the locals and planned activities that include children who live in the region. Take it easy: Flights to Africa can take 10-20 hours — stop over en route so everyone can acclimate to the time difference. Pack lightly: Luggage space is very limited on small internal planes to and from the parks. Some lodges can provide outerwear; ask your travel agent for a list of essentials. What to Wear: Dress in neutral colors and layer cottons for warmth in the cool nights: Be prepared to do some handwash by carrying biodegradable soap powder. Shoot pictures: Take more than one camera and extra data storage! Disposable panoramic cameras are good for younger children. Health: Inquire up to 6 months in advance about necessary immunizations. Visit the CDC’c online Traveler’s Health section at cdc.gov/travel, and consult with your pediatrician. Carry in hand luggage your own First Aid kit with the usual essentials, including insect repellent and sun screens made specially for children. Most items can be bought locally, but are expensive. Collect. Bring zip-loc bags and small plastic containers to store collectibles such as found bugs, leaves, dried flowers, feathers, and to preserve stamps, ticket stubs, etc. Then let the adventures begin! I’ve heard that the migration of the wildebeast is an amazing spectacle. Does anyone know which country has the best viewing and what time of year it takes place? 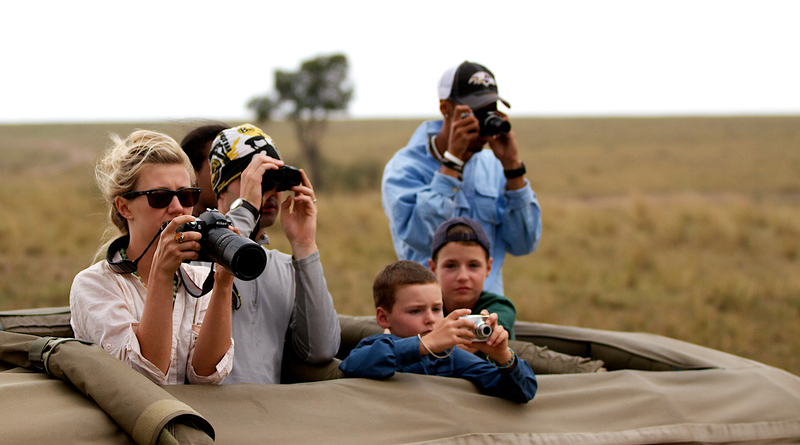 Thank you for these tips on how to plan a family safari! I’d like to be able to take my whole family and show them the beauty of Africa. But it always seemed so daunting to plan a whole trip that everyone would enjoy. I mean there’s always the age differences, and differences in interest as well to think about. Just thinking of ensuring that everything goes well planned is stressing me out. That’s why I turned to the internet in search of tips! Definitely will use your tips on how to choose a safari.